Splash worsteshire sauce on both sides of the steak. Sprinkle liberally with the seasoning. 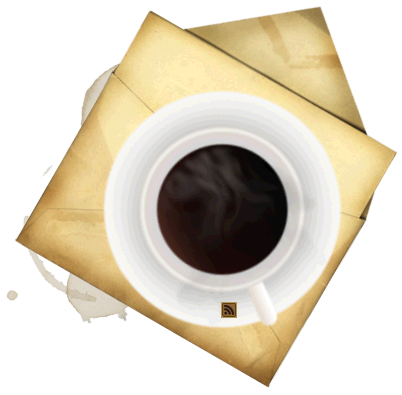 Let sit for at least an hour — up to several hours. The longer it sits, the more tasty the steak will be. 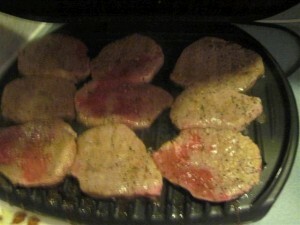 I cooked this using the George Forman grill. For a cast iron grill pan or an outdoor grill, you may choose to cook your onions a little differently. I also did this in a hotel room. I don’t use a microwave at home, and would have used a small saucepan over a medium heat to heat the mushrooms. 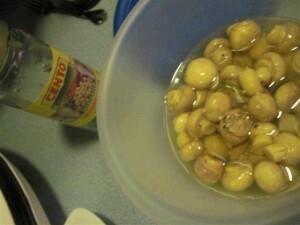 Empty the mushrooms, including the juices, into a small bowl. Heat in the mircrowave about 1 minute, or until hot. 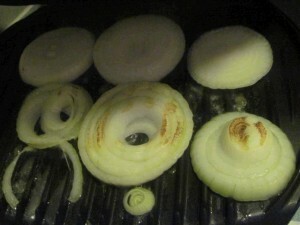 On a cold George Forman Grill, put a pat of butter at every spot where you will put the onions. Set the onions on the butter pats, then plug the grill in. Shut the lid. Heat for about 3 minutes or until the onions start to brown. 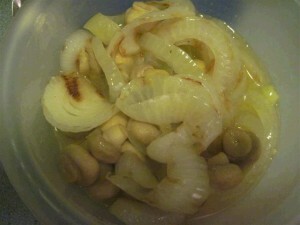 When the onions are cooked, put in the bowl with the mushrooms and heat for another minute. Do not clean the grill. Put the steak on the hot grill. Cooking time depends on your preference for doneness and the thickness of the steaks. 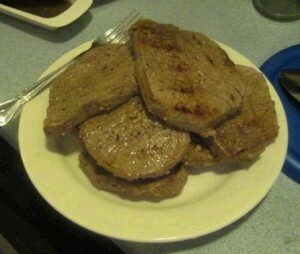 The steaks used in this picture were relatively thin and were cooked to a medium doneness. They were on the George Forman grill for about 3 minutes. Everyone likes their steak a particular way. 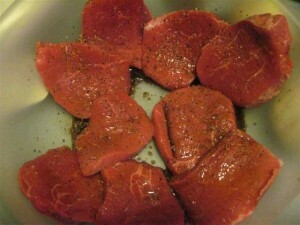 When you’re cooking thin steaks, be prepared to have them come off of the heat very quickly. Even well done you don’t want your steaks dried out. The best thing to do is to practice with different cuts of meat and the same grill medium so that you learn how best to cook for your family.